Roosevelt Griffin (top right) is surprised in his classroom. NIU School of Music alum Roosevelt Griffin, band director at Gwendolyn Brooks Middle School in Harvey, Ill., is the recipient of a 2014 Golden Apple Award for Excellence in Teaching. The 2014 honorees, selected from a pool of 620 nominations and 272 applicants, represent fourth- through eighth-grade teachers throughout the Chicago metropolitan area. According to the Golden Apple organization, words cannot begin to express the impact the 2001 NIU alum has had on his students, both at Brooks as well as those who have crossed his path across the country. Parents marvel over the transformation their children have made while participating in his band program. Community leaders are thankful that Griffin made the decision to work in and give back to the district, and most importantly to stay in the area where he was born, raised and went to school. His teaching care is transformational in nature and results in an outstanding student product that is reflected in the elevated performance of an outstanding middle school jazz band that has taken the stage of the Chicago Jazz Festival and received high acclaim. 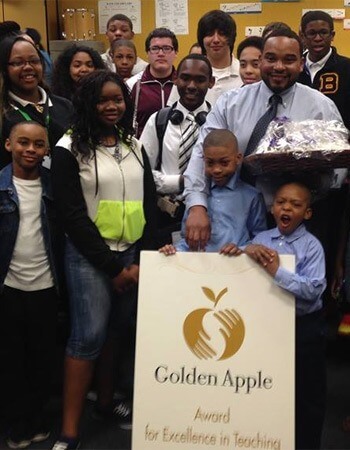 Golden Apple has recognized outstanding Chicago-area educators annually since 1986. Each Golden Apple Award recipient receives a tuition-free, spring quarter sabbatical to study at Northwestern University. Each recipient also receives a $3,000 cash award. Recipients will be honored at a black-tie gala Friday, Oct. 24, at the WTTW/Channel 11 studios in Chicago. WTTW will broadcast the awards in a one-hour television program following the event.